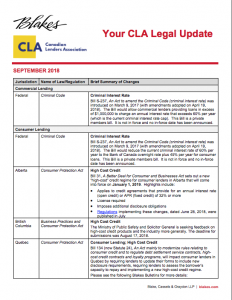 This monthly report covers any consumer and commercial Lending regulatory and policy activity on a provincial and federal level for the month of January. The report is prepared monthly by the Advocacy and Regulatory Committee of the Canadian Lenders Association. https://www.canadianlenders.org/committees/ Special thanks to Blake, Cassels & Graydon LLP.